General Mills Box Tops - Collect box tops from participating General Mills cereals, snacks, ziploc, etc. Simply clip the box top logo and send them to school with your child. 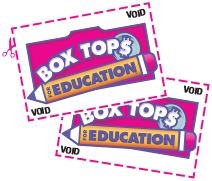 Visit the Box Tops website for more information and a list of qualifying products. Last year we received over $1,800 from Box Tops! Please note: The Campbell Labels for Education has been discontinued by the Campbell Soup Company. Kroger - link SAS to your Kroger Plus Card to participate in Kroger's Community Rewards program. The SAS Community Rewards id is 80223. Click here for instructions on linking your card. Once your card is linked to SAS, we will receive a percentage of your eligible purchases each time you use your Kroger Plus Card. You must link your card every year starting on August 1st! Tom Thumb - we earned $639 from this program for the 2nd quarter of 2016! Pick up a copy of the Saint Andrew Catholic School Tom Thumb card with our code, #661, from the office and show it to the checker - or just ask them to link your card to Good Neighbor code #661. The checker will then link your Reward card with SAS. Once linked, show your Reward card every time you shop and SAS will receive a percentage of your eligible purchases. You will only have to do this one time! Several times throught the year, Saint Andrew Catholic School teams up with local restaurants for a profit share. A profit share is held on a particular day and if you eat at our partner restaurant or puchase gift cards on that day, they donate a percentage (usually 20% or 25%) to SAS! In the past we've held restaurant nights at Cousin's BBQ, Rosa's Tortilla Factory, and Mama's Pizza to name a few. Check the school calendar for 2017-2018 Restaurant Night opportunities! They will also be included in the church bulletin and the school newsletter as we approach the actual dates. Green Recycling Bins are located in the gym/cafeteria parking lot. Take all of your clean paper (magazines, catalogs, newspapers, mail, office & school papers, etc.) to these bins. Please do not put: cardboard, plastic, glass, metal, or trash since the school has to pay to haul these items away. Remember to share these easy fundraising opportunities with grandparents, family, neighbors, and friends!